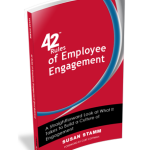 Download the sample book which includes your four starter rules: 42 Rules of Employee Engagement (2nd Edition). Meet with peer leaders for an hour per week over four lunch periods to read and discuss one of the four rules. How does the rule relate to you and your team? View and discuss the videos below that relate to the rules being discussed as you meet. Each week after meeting, download the worksheet that corresponds to that week’s rule below. Spend the next week working through the proposed actions. Be ready to share progress with the other leaders when you meet the next week. Share challenges, support one another, coach one another and learn from each others success and challenges. How relevant is the rule to your team or organization? Use the worksheets to transform engagement levels on your team. Lg Group Quiz Matching Game.pages – use the “EEIQ pop quiz” in a fun large group activity to heighten the awareness of the cost and impact of employee engagement while pointing out to team leaders who seems to have the greatest impact on engagement. Print the questions out on card stock, one per 8.5 X 11 page. Print out the answers and cut into individual strips. Distribute around the room and ask everyone to find the question that matches the answer they are holding, or answer that matches their question. It ‘s a large group quiz activity to match up questions and answers. When they believe they have all the correct matches, have participants form a line in the front of the room in chronological order (the questions are numbered). Participants read aloud the question and what they believe to be the correct answer. Provide the quiz handout (below) to capture the correct answers as you utilize the quiz “Master” to walk through, commenting on the answers, making corrections as necessary. Because team leaders are so critical to the success of their team, we recommend you consider offering front line supervisory training to these leaders. Join us for a Virtual tour of Vital Learning’s supervisory modules. Experience a few exercises and evaluate our solution for your team leader’s needs. Attendees get a demo workbook and access to a corresponding demo online course for a complete evaluation of this solution.